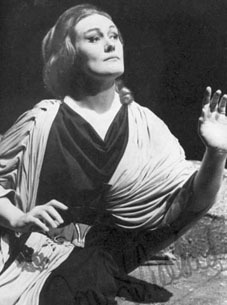 Australian soprano Joan Sutherland was one of the world's most famous and beloved opera performers, known for her lovely voice, remarkable range, and commanding stage presence. Her father, a tailor, died when she was six years old, and her mother, an amateur singer and piano teacher who introduced her to music, would not allow her to take formal music lessons until she turned 18 years of age. She worked as a typist after high school, and won two years of free vocal lessons in an amateur competition. She made her professional debut in Sidney in 1947, playing Dido in Henry Purcell's Dido and Aeneas, and soon came to London, where she studied at the Royal College of Music and was hired by the Royal Opera for £10 a week, after her third audition. She was mentored by and married to conductor Richard Bonynge, and he urged her toward the coloratura repertoire. Well reviewed from the beginning, she had a long apprenticeship of supporting roles at Covent Garden, and made her breakthrough performance in a 1959 production of Gaetano Donizetti's Lucia di Lammermoor, which became her signature role. In the same year she underwent an experimental sinus operation to resolve recurring problems with clogged nasal passages. She was best known for performances in the bel canto repertoire, an Italian term loosely applied to the elegant Italian singing style of the 18th and early 19th centuries, featuring vocal trills, extreme high notes and other musical embellishments that can showcase a singer's shortcomings or brilliance. The bel canto style, heard in the operas of Vincenzo Bellini and Gioacchino Rossini, was not frequently performed when Bonynge helped her master it, but was revived in the popular repertoire largely through Sutherland's spectacular performances. It was Italian audiences who gave her the nickname "La Stupenda". Bonynge was Sutherland's preferred director for the length of her career. "For me he is the perfect conductor," she said. "He knows how to allow for breathing, and he has a complete knowledge of how I feel and what I am capable of." A diva only on stage, she was universally described as down the earth in her private life. She retired in 1990, closing her career with an operatic rendition of "Home Sweet Home" in her home town, at the Sydney Opera House. She died in 2010, leaving some sixty albums and a reputation as one of the most celebrated opera singers of all time.